Sketch-3D is an interactive, integrated software/hardware system that enables users to create their own anaglyphic 3D drawings. 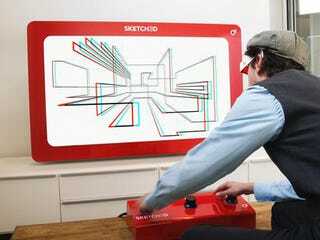 By using a ubiquitous interface metaphor (the "Etch-A-Sketch "), Sketch-3D allows anyone to participate in generating stereoscopic imagery in a way that is simple and engaging. In addition to the personal experience, Sketch-3D can be scaled to work with any output device from large scale projection to plasma displays to an integrated LCD. This versatility allows for Sketch-3D to be tailored to fit a wide array of installation environments.